Captain Ian Engelbrecht has 30 years experience and plenty of qualifications. - Steward Marine was awarded the delivery contract by First Choice Marine, incorporating The Moorings and Sunsail charter fleets. - Indigo Yacht Management is an international company providing you with a personalised Cape Town yacht delivery service. - The Royal Cape Yacht Club is in the south-eastern part of the commercial harbour, just 5 minutes drive from the city and the V&A Waterfront Cape Town. This is a well managed marina with almost all facilities. - The Marina in the "V&A Waterfront Cape Town" which is the favourite tourist centre on the eastern end of the harbour. Don't forget to call the bridge control to have access at the marina!! !You must use channel 71 in VHF. Otherwise, you can phone V&A Marina Manager (021-408-7835 / 083-543-5711) to get a direct number. The V&A waterfront is the place to be when you arrive in Cape Town! You will find a great variety of hotels, restaurants and shops. The best hotel and restaurant I would recommend is the Cape Grace hotel and its restaurant, "Signal restaurant", which is right in front of the marina and serves superb food. There are also other options to dock close to Cape Town such as in Hout Bay harbour- 20min drive which is run by the department of Seafisheries as a yacht marina and an active yacht club. This is a nice place to dock and less expensive than in Cape Town. I have experienced myself a sunset cruise on Tigger 2 and I loved it! A friend of mine booked the entire boat for his birthday. 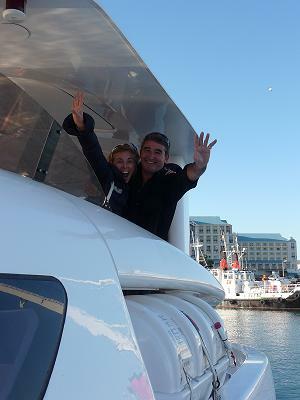 It's a shippered yacht charter and it took us to Table Bay where we had a glass of Method Cape Classique sparkling wine with pâté on toasts. We ended the cruise with a fantastic braai onboard. This was such an exquisite experience! If you prefer you can also have luncheon cruise where you'll be able to see the beautiful Clifton 4th by day from the sea. Another lovely option is the The Princess Emma which offers a most exclusive travel experience. It has been built by Princess Yachts in the United Kingdom which has been acquired by LVMH, a French company which has in its stable a number of other exclusive brands including Louis Vuitton, Moet et Chandon and Hennessy. - Cape Charters offers luxury cruises, fishing, shark diving, harbour tours, water taxi! To give you an idea, a luxury cruise to Clifton, minimum 2 hours, max 12 people will be R 2750/ hour (drinks and snacks incl.). - The Tigresse is a catamaran which can carry up to 60 passengers. 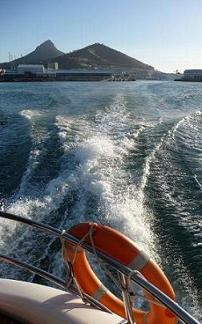 Sunset cruise from 17h30 to 19h00- R180 with a glass of champagne incl.It can be perfect as a corporate yacht charter. - The Waterfront Boat Company offers various cruises and give you the opportunity to design your own cruise such as a barbecue cruise! Quote on request. - The Seahorse is perfect for a romantic evening...Enjoy a meal while you're cruising. - Atlantic Adventures will take you for a high speed ride on a 12 seater inflatable! 1 hour ride R 300pp. For the fishing lovers, the Two Ocean Sport Fishing proposes fishing trip. There are several sailing schools in Cape Town. They offer different courses related to your needs. - Ocean Sailing Academy: The only RYA accredited Sailing School in South Africa is based at the V&A Waterfront, Cape Town. It offers the full range of RYA Sailing and Motor Cruising career courses for the private and commercial boating industry specialising in the RYA Yachtmaster Offshore and Ocean courses for sail and power. Qualifying SAS courses for local cruising are also available. - Good Hope Sailing Academy: They offer a competent crew course, day skipper course, SAS Coastal and yachtmaster offshore course. If you need any other information on Cape Town yach delivery, don't hesitate to contact me.